Welcome to my series of ‘More Round Wins’ race articles. 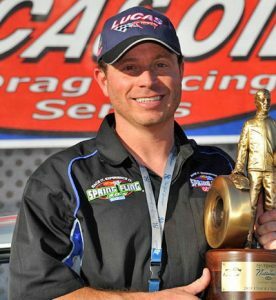 This is a look inside my brain, the way I think, and what has contributed to some of the racing success I have had in drag racing over the past 2 1/2 decades. Within this series, I will break down and get specific about what I call ‘situational racing’. In this article, I will be talking about my mind-set of racing without fear, how important it is, and how this concept has helped me get more round wins! All forms of sports require a mix of mental and physical talent to be successful. I can’t think of a sport that is more lopsided on the mental side than drag racing. There is so much that can be said about the psychology of racing, but because of space limitation, I will stick to the single, most important one. The single, biggest barrier that stands between you and the win light….FEAR. I can remember being 22 years old and very new at national event racing when a well known, very successful racer and I were paired up for round 2. Round 1 was Friday morning and round 2 wasn’t until Saturday morning. This meant I had 24 hours to stare at my name paired up with his name on the ladder. Too much time to think about having to run this Goliath of a racer. Plenty of time to convince myself I was a big underdog. Hell yes I was scared. On top of his talents and endless string of accolades, he did everything he could to intimidate me and try to get in my head. He was smart, a good driver, and very experienced. He knew very well the havoc fear would play in his opponents mind. Here I was; a newbie to the national event scene and I was about to face the best on a big stage. Yup, a true David vs. Goliath matchup. Or was it? Fortunately, I was cognitive enough to put this fear to good use and ‘flip the switch’. Fortunately, I was aware enough to step back and look at the big picture and that’s when it hit me. I began to talk to myself; “this is a numbers game and I can put up numbers just like he can so what am I afraid of?.” As my good friend Jeg Couglin once said “Preparation is King” and me and my car were prepared to do the job. That triggered confidence in me, eliminated the fear, and helped me to win the round. I took 5 minutes to analyze the current conditions/ situation and came up with a pre-race plan that I felt played to my strengths of both me and the situation. Then it was a matter of putting my mind to it and executing my plan. This meant 30 seconds of focus, 30 seconds of the right mindset. Wait….. Did I say 30 seconds? More about my 30 second rule in an upcoming article. When I speak of fear in racing, I am talking about fear of losing. Worried about who you are racing against (that you will lose). Fear of red lighting (and lose). Worried that you may be late on the tree (and lose), scared that you may not have the car dialed in right (and lose). Simply put; just the fear of losing and having to load up. When fear enters your mind, step back for a second like I did and look at the big picture. The type of racing we do is 90 percent mental and winning stems from confidence. Do your homework before the race and before the round and by the time you make it to the staging lanes you should be prepared to lay down good numbers and good numbers can beat ANYBODY! When racing without fear you WILL get MUCH better results, period. Have you ever watched someone during a test and tune kill the tree all day long? I know I have. It’s because there is zero fear on a test and tune session. The racer is not worried about red lighting and not worried about losing. The key is to adopt this mindset when the chips ARE heavy on the table. Only thoughts of executing your game plan (regardless of who is in other lane) and regardless of what your last run was like. The biggest link I see with fear and losing a race is the overestimating of your opponent. Overestimating your opponent causes your inner confidence to go down and your subconscious tells yourself that you are an underdog which in turn leads to fear. This fear leads you to do things you normally wouldn’t do. You are likely to try ‘too hard’ which leads to you forcing things and takes you out of your zone. Now your chance of winning the round just went down significantly as you try to force things. I find I am at my best when I race without fear and just go after it. So I urge you all to race without fear. Race like the round is YOURS to win and go get it! Say these words to yourself “this is a numbers game and I can put up numbers just like he can” whenever you feel like you are at a disadvantage in a certain round. This will put everything in perspective and will wipe away any fear you may have had to race your ‘intimidating’ opponent. Remember, this is not a wrestling match where you are 90lbs and he is 300lbs. You can beat anyone at any time simply by executing for a short time period and most importantly racing without any fear. Race to win, stay aggressive, and have fun. Stay in this mindset and you will be surprised how many more win-lights you will turn on. What is the right mindset and how do I get myself there? I often get asked to explain ‘the right mindset’. In short, here is a quick summary. Whenever fear or doubt enters your mind, you need to consciously turn it into confidence. You do this by flipping an internal switch. Whether it be in the staging lanes or in the staging beams, if fear enters your mind you have to train yourself to IMMEDIATELY flip that switch. So what’s on the other side of that switch? Thinking about what you need to do (task at hand) to win the round. In other words, instead of thinking of going red (or fear of your opponent), think about simply executing and remind yourself it’s not that hard to hit the tree. You are simply reacting to a signal. Whenever I doubted myself in the past I simply talk to myself and say “Focus and React”. I actually say this out loud at times under my helmet. We all have the capacity to react within thousands of a second over and over. It is just a matter of confidence and the right mindset. Reminding yourself how easy it is to react to a signal if we are in the right mindset is important. Train yourself to flip that internal switch from fear/ doubt to confidence and eventually ‘flipping that switch’ will become natural to you. Flip the switch! The right mindset always starts with what I call an even keel. Never too amped up and never too relaxed. If you are too amped up, you subconsciously will try to force things. If you are too relaxed, you may not be alert and your mind can wander. I call it a calm alertness, in control of my emotions. When in this mode, I set up my mind for an unconscious response to react to the signal (the tree). If you can do this, you will have more consistent reaction times. Think Calm Alertness! You are alert but not ‘over’ thinking. You did all of your thinking at the trailer and in the staging lanes when you came up with your game plan for the round. In the pits you are the coach. Once you pull into the pre-stage beam you are the player. Remember, by getting in this right mindset you will set yourself up to be able to naturally react to a signal (the tree) and make quick, smart decisions down track. Think Sniper Mode! Not over-reacting to a previous round where you drove badly. Never over-compensating for a previous round red light or poor finish line driving. On the other hand, never getting too complacent. This can commonly happen after you just took out a big name and now you are racing a name you never heard of. Always go into a new round with a clean slate and focus on executing the task at hand. Don’t think of previous rounds and don’t be concerned with what you are up against after the current round. Focus on the task at hand! Often I hear people talking about their game plan for the next round and I hear them say “Well I don’t want to red light so I am going to……” Or “I don’t want to screw up the finish line”. These people put themselves at a big disadvantage before they even turn the pre-stage light on. These are classic cases of ‘Racing Not To Lose’ instead of ‘Racing To Win’. When you ‘Race Not To Lose’ your subconscious gets filled with doubt and this clouds your mind like a busy intersection while you are trying to cross the street. When you ‘Race To Win’, you clearly focus on the specifics of executing. Stay aggressive and go get the round win! In closing, I can’t preach enough how important it is to go out there and race like you have nothing to lose. Yes there are big purses out there to win but chances are we are not depending on the winnings to put food on our table. If you lose that ‘big round’ chances are you will still have a food on your table and a bed to sleep in that night. Have fun and race like you have nothing to lose. Trust me; the win-lights will follow!